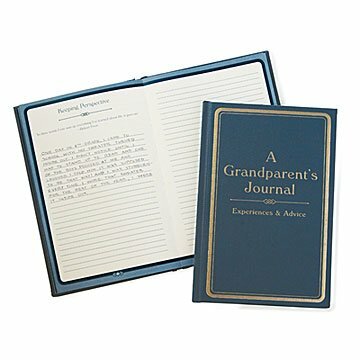 Pass down words of wisdom with this inspiring journal filled with a grandparent's advice. The gift that keeps on giving, this charming fill-in journal collects Nana and Pop's experiences and lessons learned into an artfully bound keepsake finished with a pressed champagne foil cover. Filled with topics ranging from family, love, and friendship to blazing your own trail and questioning authority, each prompt comes with an inspirational quote and four blank pages. Grandparents can share their own unique stories and the life lessons we all encounter with their grandkids, who will cherish them for decades to come. Made in San Antonio, Texas. Click to view a pdf of the journal and card content. This item has been discontinued and will not be restocked. Check out our best selling journalMy Life Story-So Far as an alternative! A perfect gift for Grandma! Such a great idea - this is the perfect gift for my mom from my kids. I know the journal will be for them, but I can't wait to read it, too! The journal is such a simple idea that can have such a lasting impact. The messages at the top are great starters and can bring out years of wisdom. It seems perfect! It will be!! This is exactly what I wanted for my mother and father! I am just so excited for Christmas! For them!! The journal was primarily open pages. Expected more crafting specific to being a grandparent. Good quality; looking forward to seeing what they write!